If you want to be instantly alerted in the event that you are exposed to unacceptable levels of radiation, the NukAlert has you covered. 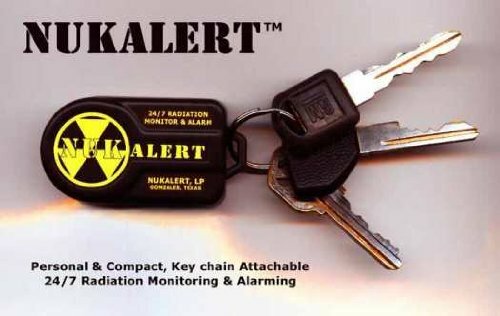 This radiation monitor comes in the form of a convenient and easy to carry keychain. It ensures 24 hour per day monitoring and lasts up to ten years on a single battery. The NukAlert is constructed following all relevant FCC and European Community regulations including those regarding emissions, electromagnetic compatibility, and more. It is immune to EMP attacks, ensuring that even in a catastrophic situation, you will still be able to monitor the radiation levels and ensure your safety. The NukAlert has a variety of different alarms covering different levels of radiation. It comes packaged with tips for survival in a nuclear emergency situation, since knowing about dangerous radiation requires you to take the appropriate actions in response. NukAlert stands behind their product with a full two year warranty and an additional ten year prorated warranty, giving you confidence in the quality and reliability of this crucial safety product. The NukAlert has mostly positive reviews from previous buyers. The average rating is around four out of five stars, which speaks to the satisfaction of customers who have bought the NukAlert. One buyer even used the device to monitor when it was safe to be close to his wife after he received an unsafe dose of radiation. Another happy customer used this radiation monitoring unit to regain his ease of mind as a California resident who was concerned about contamination resulting from the tsunami and nuclear power plant damage in Japan. If unsafe levels of radiation are a concern of yours, the NukAlert is an indispensable safety device that is more than worth the purchase price. If the radiation level around you ever becomes unsafe, you will know and be able to take action immediately.